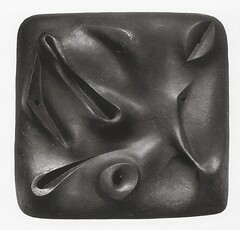 sculpture: model for This Tortured Earth. dimensions: 28" x 28" x 4". Noguchi apparently said he'd conceived the piece after seeing an aerial photograph of a North African desert riddled with bombs. I can understand the literal destruction and idea for representing it, but I suspect there's much more angst in this work that addresses human interaction, behavior, hatred, violence, racism, and other forms of discrimination. I see this work as a abstract reconceptualization of his earlier, more literal image of a contoured, twisted human figure in Death (Lynched Figure) of 1934. Following the Japanese attack on Pearl Harbor (Sunday 7 December 1941), people of Japanese descent in the Western part of the United States were interred in relocation camps. Noguchi voluntarily left New York to work with the Japanese-American community. He made plans for crafts, parks, playgrounds, etc. for the settlement in Arizona where he was placed (Poston I). The government managers (Bureau of Indian Affairs because the settlement was located on Native American reservation) encouraged him to develop these plans for improving the life of the Nisei (people of Japanese descent born in the U.S.). Unfortunately, they had no intention of providing him with any assistance. It seems that Nisei viewed him with suspicion because of his cooperation with the government. After enduring terrible living conditions, heat of 130 degrees F., people being made to construct their own dwellings, stuff their own mattresses, etc., he eventually decided to leave. At that point, his case came to the attention of Washington bureaucrats who opened an FBI file on him. He was refused permission to leave. A more recent color photograph depicts this piece at a downward angle where it is positioned like a table. Archival photograph by Kevin Noble.